Magnet mesh clever clean nyjer feeder featuring Droll Yankees' Onyx Clever Clean base and a Birds Choice patented magnet mesh black painted screen. Our magnet mesh metal nyjer feeders are some of our most popular products so we are proud to introduce the new nyjer feeder with the added bonus of the Droll Yankees' clever clean base. Featuring our patented magnet mesh which tests have proved will attract up to double the number of birds than other mesh on the market. 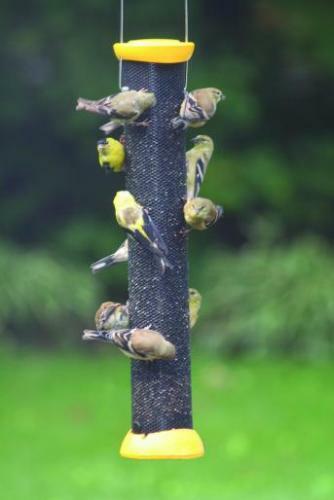 You will love seeing this screen just loaded with finches and their friends feasting on nyjer or our Special Finch Mix. I bought this feeder for my 76 yr old mother who has numb hands. She loves the ease of the lid and the fact that the bottom "pops" off for cleaning. She has counted as many as 30 finches on it at one time.